Slip-retardant sheet for areas requiring an extra measure of safety. 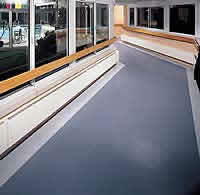 Meets or exceeds ADA slip-retardant performance ranges. Low profile surface for easy maintenance. Recommended for dry areas. Styled for all commercial interiors.